Filling out surveys on each classroom. 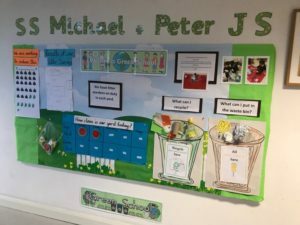 The Green Schools Committee held a whole school Day of Action on the 16th May. 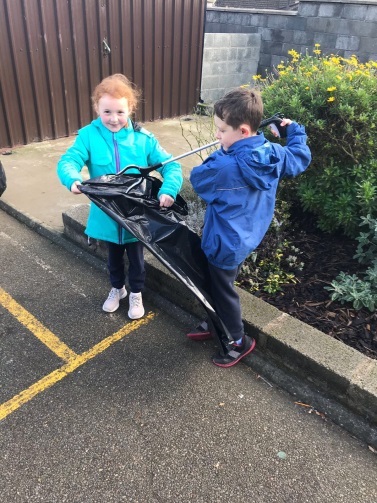 Two children from every class along with some of our teachers, SNA’s and the principal went out into the community and picked up litter on route to Abbey Graveyard. At the graveyard we were met by the tidy towns and we cleaned up and weeded the area as well planting two pots. 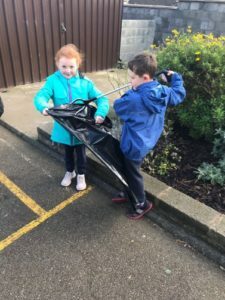 Back at school we had a big focus on Litter, as well as the effects of Litter and each class was invited to take a walk around the school grounds to make sure we were completely litter free. The whole school then took part in a Tree Planting Ceremony where we planted a sycamore and a willow tree to symbolise the two buildings of our school, growing and working together. Jimmy, our school chairperson came and said a few words and we all recited Our Green School Code. We had a great day. Have a look at all the action below. After gathering all the information the Green school Committee came up with a Plan of Action to help us reduce our Litter and Waste. Check out some of their action plan below. Every classroom now has a recycling bin and a general waste bin. The whole school will be learning lots about the three R’s; REDUCE, REUSE & RECYCLE! To help reduce the schools waste, all children must bring home any waste they bring in with their lunches and sort it into the correct bins at home. 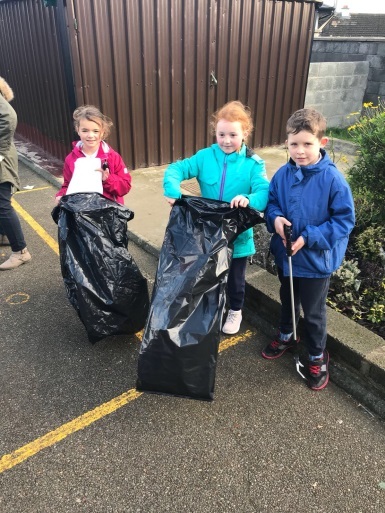 We now have litter wardens on duty each school yard every day and they are doing a fantastic job keeping our school grounds litter free. The Green School Committee are running a competition to come up with a Green School code in the form of a song, rap or poem. The winning entry will be displayed on our Green Schools notice board and the song or poem will become our Green School Code. Some of our Committee Members and Litter Wardens hard at work. 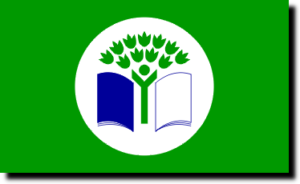 Green-Schools is a European educational programme which promotes responsible behaviour towards the environment among school children and the wider community. Known internationally as Eco-Schools, Green Schools is an international environmental education programme, environmental management system and award scheme that promotes and acknowledges long-term, whole school action for the environment. 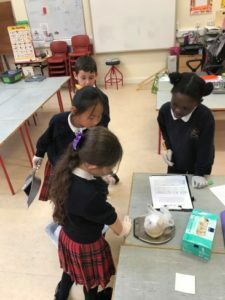 The Green-Schools campaign in Ireland is managed by An Taisce, the National Trust for Ireland and it is run in co-operation with Local Authorities throughout the country. As a learning resource, it aims to increase students’ and participants awareness of environmental issues through classroom studies and to transfer this knowledge into positive environmental action in the school and also in the wider community. One of the key success factors of the Green-Schools programme is that it is a themed programme. That is, schools undertaking the programme work through a seven step programme for each theme. 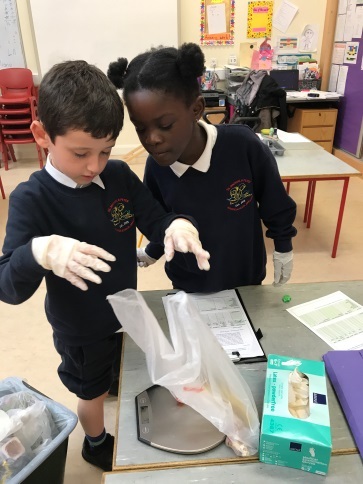 This process helps pupils to recognise the importance of environmental issues and take them more seriously in their personal and home lives. As an award system, Green-Schools promote and acknowledge long-term, whole-school action for the environment. SS Michael and Peter JNS has started the process of working towards becoming a Green School. Pupils and staff are working together on the theme of ‘Litter and Waste’. The Green Schools Committee is currently being set up. There will be representatives from every class level. The committee will meet on a regular basis. Watch this space to learn about all our efforts to become a green school and to reduce our litter and waste!